2019 Update: Tech keeps evolving, and so do baby monitors. With new models appearing on the market every year, it’s important not to base our choices on outdated information. We’ve updated the information in this article to account for the newest products available. The arrival of a new family member is always a joyous occasion, and naturally, it’s every parent’s desire to keep their child safe and to always be calm that everything is okay. The realities of life prevent you from being in the same room as your baby every minute of every hour, and whether you’re in the neighboring room or maybe a bit further away while someone else is keeping an eye on your child, you’ll still want to make sure they’re okay occasionally – remotely. The same is true once you reach the phase where you sleep in a different room as your little one. You’ll want a way to check on them during the night without disturbing their sleep. 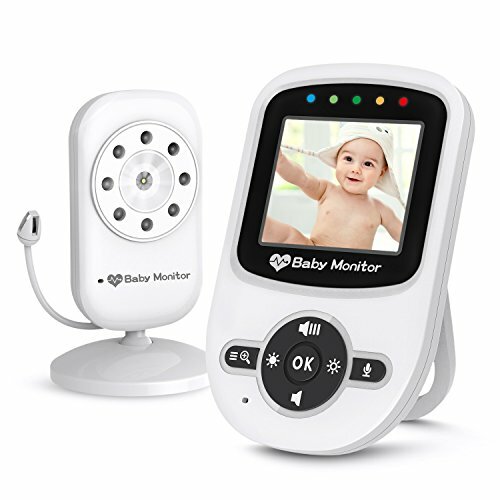 Remote baby monitoring has advanced considerably in the past decade or so, as simple breathing monitors have been largely replaced by full audio and video monitoring devices. Years ago, the only affordable method of keeping track of your baby was via a breathing monitor that sounded an alarm when the baby’s natural breathing pattern was interrupted. Today, it’s commonplace for parents to be able to hear and even see everything their babies are doing thanks to monitoring devices that are not unlike home security systems. The advancements in baby monitoring tech are closely related to the proliferation of home security systems, and you’ll notice many similarities between the two classes of product. Some of these devices allow you to record videos of your child’s nocturnal actions, which has led to several viral videos of kids getting up to all sorts of mischief at night. Baby monitors vary widely in terms of price, but a general rule is that audio-only devices are much cheaper than those offering video, and fixed camera video devices are cheaper than those which can be adjusted remotely. Video-capable monitoring devices share the most similarities with home security systems, as they’re often equipped with motion tracking and infrared night vision – both features typically found on security cameras. Video-capable monitors are available in cheaper price categories, so there isn’t much reason to stick to audio-only options these days. Higher end features also include two-way audio (another common security feature) and temperature monitoring, while the most expensive models are full-on smart devices with remote-controlled cameras and sound activation. The main features you’ll need to look out for are range and battery life in the monitoring units. Since feature sets are varied, these two are the only truly universal factors. When dealing with video-capable units, high resolution and night-vision are the most important features, and devices which lack these probably won’t be the best of choices. We’ve taken a look at products across a wide price range to compare how cost and quality lines up. At face value Motorola’s MBP36S brings interesting features to the table with a dome camera that can be remotely repositioned. With only a minimal price increase compared to the other models, this significant advantage has to be offset by some other disadvantage. And true enough, the MBP36S features a shorter operating range than most other models on the market, coming in at 200m, which is approximately 650 feet. This still should be enough for most situations, and it must be said that the range is calculated with obstacles in mind, whereas the average 900 feet range of other devices are calculated for open-air circumstances. The MBP36S stands out from the crowd with its remotely repositionable dome camera, allowing for wide-angle panning and tilting, controlled from the parent unit. 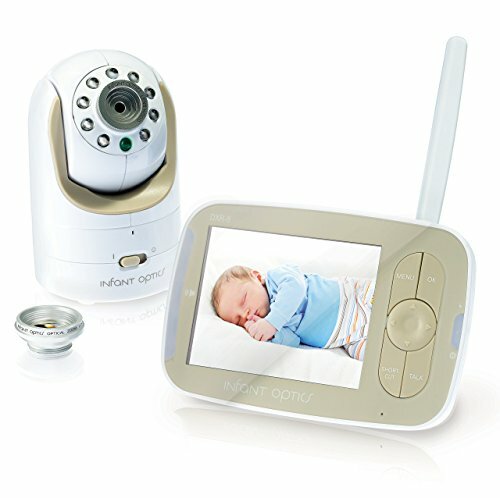 This way the sole camera can be used to cover an area even larger than that which is covered by a fully expanded network of fixed cameras – and this baby monitor can be expanded as well. Add zoom to the mix, and you have the best range of coverage on the market. We’ve covered range, panning, tilting, zooming and expandability, but the MPB36S has more than that to show for itself. The unit has a temperature monitor, like its contemporaries, as well as infrared night vision. The parent unit will signal with alarms a number of abnormalities, such as the camera being out of range, the parent unit being low on battery or the temperature in the baby’s room being too high or too low. As per usual, the camera and receiver aren’t connected via wi-fi (it uses wireless 2.4 GHz FHSS instead), making set-up easy and the connection secure. 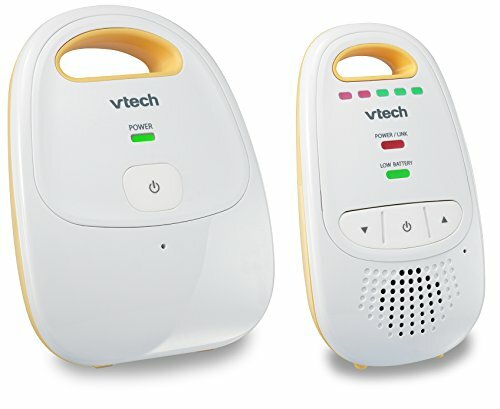 The Baby unit can play 5 lullabies to calm your child when they’re in distress, and the microphone is much more sensitive than the ones used by most competitors, activating the parent unit’s screen to smaller sounds – whether this is a bother, or lends a greater sense of safety is for you to decide. The MBP36S doesn’t out-do the competition by much, but what it does do better is enough to secure it our number 1 spot. The operating range may be shorter than in other cases, however the 650 feet range should be enough for most cases anyway. The remote controlled dome camera is a huge bonus, and the other tidbits like the better microphone push this product above the others, all at a price point only slightly above, or equal to, that of other fixed camera models. 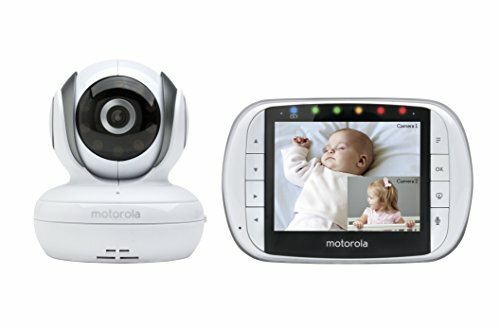 Motorola’s MBP36S baby monitor is a system that has every feature you’d need at a competitive price. Dome cameras are usually found in much more expensive models, however this one brings it, and a bunch of other nice features, to users at a mid-range price. To find something better, you’d need to pay a lot more, but the MBP36S certainly beats out others in its weight class. Remote Pan, Tilt & Zoom; The superior wireless range of the MBP36S allows you to stay connected to your baby up to 590 feet away. The Smilism Video Baby Monitor from Babysland is a mid-range model in terms of pricing that brings a competitive feature set. Consisting of two units, the “baby” unit which is the camera and the “parent” unit, which is the receiver, Smilism allows live video and audio feed to be viewed on the parent unit on demand in real time. The operating range of this device is 900 ft which, while not the largest, is still suitable for most houses. The Smilism baby monitor has one of the longest battery lives among competing products, allowing the parent unit to operate for 12 hours on a single charge in ECO mode. This power-saving mode turns off the receiver unit’s screen when no voice is detected from the baby, and automatically activates upon voice detection. The user of the parent unit can manually turn on the camera whenever they wish, of course. 2-way audio communication is a great feature to have, allowing parents to calm their babies remotely with their own voice, while also hearing the sounds (and possibly first word!) of their babies. When your voice isn’t enough to soothe a fussy baby – and let’s face it, often times it isn’t – the camera unit is programmed with four lullabies which you can activate from the parent unit. The camera is still functional in low-light conditions, as it is equipped with infrared night vision. With infrared, you won’t need to blast your sleeping little one in the face with a floodlight to see what’s up during the night, giving you peace of mind and your baby peace of sleep. The camera also has a temperature monitor to make sure things don’t get too cold or hot in the baby’s room. As your child gets older, they’ll start roaming about and will have larger areas for play than just their bed. The Smilism system allows for expansion to up to 4 cameras hooked to one parent unit. While there is no split-screen functionality and you’ll have to toggle cameras manually, it’s still a welcome feature granting the device a greater measure of longevity (just don’t use it to spy on your kids as they get older). The cameras aren’t linked via Wi-Fi or other standard protocols, so outside access isn’t possible. The Smilism Video Baby Monitor represents an absolute middle ground among the competition. It has all the necessities and a few welcome extras, including great stats and a mid-range price. It’s certainly not a bad choice at all, however some other models on the market offer extended functionality without a price hike. If you notice a lot of similarities between the Smilism model and the HB24, it’s because almost their entire feature set is identical save a few small differences, most of which work to the Hello Baby’s favor. The similarities even extend to design, and we wouldn’t be surprised if some of the internal hardware was shared between the two products, owing to the fact that the manufacturers of the circuitry used is very likely the same in both cases. The HB24 has an operating range of 960 feet. While those mere 60 feet beyond the range of the Smilism don’t mean much in the grand scheme of things, it’s still more. The HB24 also consists of a camera unit and a portable receiver with a display screen and controls. One of the biggest advantages the HB24 boasts is digital pan and tilt. While this still doesn’t allow a measure of flexibility that is provided by dome cameras, it is a boon over other fixed cameras. Though the range of “motion” is limited, it still allows for some adjustment to be made and to cover a larger area. The panning and tilting can be controlled remotely from the parent unit. The HB24 packs all of the features that you’d expect from such a device. From subtle infrared night vision, through temperature monitoring to two-way audio communication, this model ticks all the necessary boxes to be a competitive device. Beyond your standard crop of features, the HB24 shares the expandability and power-saving mode of the Smilism. In another strangely similar stroke, the HB24 also operates for 12 hours when “VOX” mode is active, which is functionally identical to ECO mode on the other product. A different, but largely unimportant, factor in which the HB24 one-ups the Smilism is in pre-loaded lullabies, as this model has 8 of them. Camera connectivity is achieved with the same secure protocol, meaning there is no troublesome set-up process involving wi-fi. Essentially, the only differences between this unit and the Smilism are range, number of lullabies, digital pan and tilt, and finally, price. The HB24 comes up at a (very slightly) cheaper price point. That said, when comparing customer reviews, more people seem to encounter quality control issues with the HB24 than with competing devices, which is important to consider. 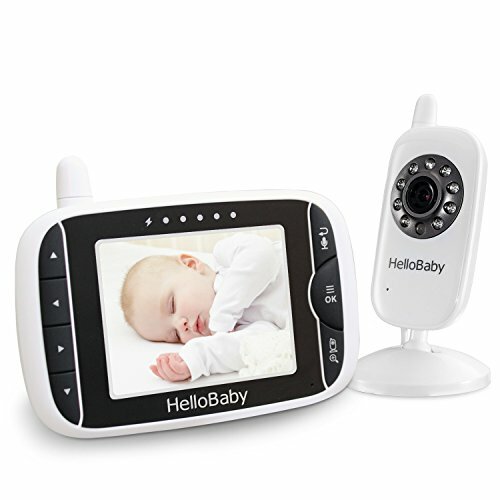 The Hello Baby HB24 Video Baby Monitor seems to offer more value at a better price than its near-identical competitor, which would give it a better position in the overall ranking, however features count for nothing if the device doesn’t work. While it isn’t as severe as to call the HB24 infamous for its issues, they are more common. With two roughly identical devices, you decide which is better, but one thing is for sure – neither are best. Hello Baby’s other offering which appears on our list won’t provide for much variance compared to previously reviewed models. The HB32 occupies a marginally higher price range than the HB24, however the differences in features are minimal. The first thing you’ll notice is the different design and the larger screen which, considering by how little this is more expensive, already warrants all the difference. The range, like the other model, comes in at 960 feet. The main selling point, and the only noteworthy difference compared to the HB24, is the auto-mute function. While the power-saving modes of the other models simply switch off the video feed of the parent unit when there is no sound detection, the HB32 uses a decibel sensor on the baby unit for a more precise reading whilst also deactivating the more energy-intensive microphone. As mentioned above, the HB32 doesn’t feature any other differences beyond that one auto-mute function. It has infrared night vision, 2-way talk, temperature monitoring and 8 pre-programmed lullabies. Considering all this, and that that larger screen and additional feature make up for the larger price tag, why do we place it lower on our list than the HB24? It comes down to reputation. The HB32 has some of the most reports of malfunctions happening *just* after the warranty is over. A fiddly auto-mute function isn’t going to make up for that aspect. The Hello Baby HB32 doesn’t offer much new in terms of features. It can do pretty much all the same things as other cameras save for a single feature of minor importance. The reason it occupies a position so low on our ranking is because the HB32 is marred by a large number of complaints regarding quality, and you want a reliable device keeping its artificial eye on your baby. When you first look at the DXR-8, it’s easy to think “wow, now this must be a high-end device”. It’s got a dome camera, a flashy white and faux-gold color scheme, and a nice polished design. Thing is, this posh exterior is just a front for a device that costs twice as much as its competitors with no benefits save for a single extraneous feature that, to truly make use of, requires even further spending. Beyond this, there is a reason why the manufacturer isn’t toting the range of the device anywhere on the store page. When a few walls are involved, the undoubtedly already short range is further reduced to a measly 65 feet, which is abysmal compared to the competitor devices boasting ranges of 900 and 960 feet. The DXR-8’s most unique feature is the interchangeable optics. The camera’s lens can be augmented with wide-angle and zoom add-ons, however of these only the zoom lens is included and any other kind of attachment must be bought separately. The camera has digital zoom by default even when using the normal lens, so presumably switching the lens just improves zoom quality. In addition to this interchangeable lens system, the DXR-8 is run of the mill. It features two-way talking, infrared night vision and temperature monitoring. Multiple cameras can be linked to the same receiver unit, allowing you to expand the network, and the receiver has a 10 hour operating time with the power-saving mode active. While the device does notify the user via an alarm if temperatures go either too high or too low, the battery starts running out or the device is out of range, these alarms may be turned off in the options menu. This is a newer feature added in a reissued run of the DXR-8 model, due to complaints of the annoying beeping produced by earlier models. As the unit has a dome camera, much like the MBP36S,the position of the camera can be remotely repositioned. This is certainly a major bonus, but the aforementioned other device offers the same feature at a much lower price, simply because it isn’t straddled with the pointless optics feature. While the dome camera is a neat feature, the massive price of the Infant Optics DXR-8 just isn’t justified by the interchangeable lens feature. Considering you need to go to the camera and change it every time you need the attributes of a different lens, it’s more of a hassle, other cameras achieve the same effects with a single lens, and you’re not trying to shoot a winning picture for National Geographic’s wildlife photo contest. Instead you simply want to know that your baby is okay – and you don’t need wide-angle or zoom lens for that. The DM111 differs from every other product we’ve looked at in this guide so far due to it being an audio only device. The price is miles below any of the others accordingly. However the functionality is also, obviously, significantly more limited. We would have assumed that, due to only audio being transmitted, a significantly larger range would accompany, however there is only minimal increase. The DM111 has an operational range of 1000 feet, barely more than that of video-capable competitors. … however, the unit is not rechargeable and once those 20 hours are up, you need to replace the batteries. Oh, and the product does *not* include batteries from the get-go. For general use, the parent unit is intended to be plugged in at all times. The DM111 also lacks a wealth of features that the video-enabled devices pack. The only thing this is capable of doing is relaying sound one-way, so it’s basically a neutered half-walkie-talkie. The only notable feature is a set of five indicator lights showing the level of volume the device is picking up when the speaker is muted. Of course, considering the device costs less than a hearty meal, this is to be expected. While the shortcomings of the DM111 can be chalked up to its very low price, we still feel that a lack of features doesn’t justify it. You’re likely only going to buy a baby monitor once, or at most once per baby if it gets lost or broken in between. For a one-time buy, the video-capable units aren’t too expensive, and this model isn’t particularly useful. 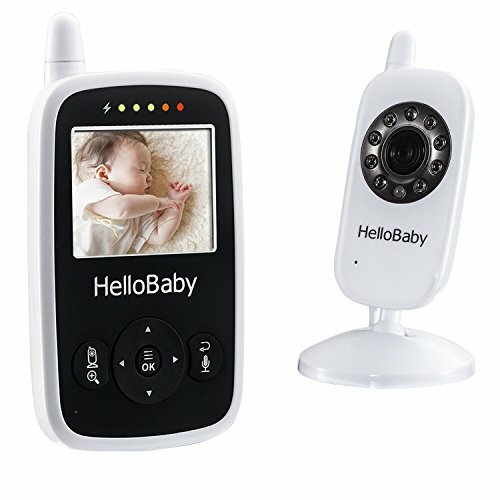 As outlined in the summary for our final product, when purchasing a baby monitor prospective buyers should place into perspective that fact that this is basically something you only need to buy once, and it is, after all, a device which you rely on for the safety of your baby, at least while you’re not in the same room with them. Mid-range video-capable units aren’t too expensive, and this isn’t something worth skimping on. In our reviews, we placed a greater emphasis on the repositionable nature of dome cameras, however granted, this feature only becomes important as a baby becomes older and moves more. As the parents of newborns, some of you may consider other factors, such as range or battery life, to be more important. But it’s also important to keep in mind that you’ll probably be using this monitor for around 3 years, and the “newborn” phase is the smaller chunk of that time. It should be noted that functionally, these products differ very little from pet monitors and cameras, and almost all of them had at least 2-3 reviews stating that the purchaser ended up using it precisely as that.